A hospital and an air ambulance trust have "agreed to disagree" after a dispute over a baby's treatment. 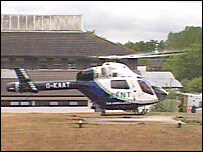 The Kent Air Ambulance Trust accused the Queen Victoria Hospital, in East Grinstead, West Sussex, of changing the referral policy for its burns unit. It wanted to fly an eight-month-old with burns to the hospital but a doctor recommended the baby should go to A&E. The hospital said national guidance was followed. The two bodies now plan to improve relations and share practices. The row erupted at the beginning of August after a mother took her eight-month-old son, who had suffered burn injuries, to the Kent Air Ambulance base in Marden. The trust said a referral to the Queen Victoria Hospital was refused because there was a policy of not accepting air ambulance patients. The hospital insisted it welcomed "all appropriate referrals", but in this instance the nearest accident and emergency unit was deemed more suitable. 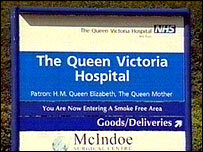 The baby was ultimately admitted to Maidstone Hospital and then went to the Queen Victoria's burns unit a day later. Now the two organisations are implementing joint-working measures, including the hospital's burns and plastic surgery specialists sharing their knowledge and experience with air ambulance doctors. Air ambulance chief executive David Philpott said: "We have both agreed to differ on what happened in this particular case and instead focus our energies on ensuring that people in the South East continue to get excellent care." Sharon Kearns, chief executive at the Queen Victoria Hospital, added: "We are really pleased we can work with the charity to promote best practice." The baby involved in the row is now understood to be recovering after having a skin graft on his lower leg.